The products mentioned are those that I have used over time and found to perform very well. I purchased this unit on a bit of a whim, since it had received many accolades on forums and in the press. But all I really wanted to know was, just how good my Schiit Bifrost DAC could really perform. However, I was not expecting the level of performance improvement this very affordable unit brought to the digital side of my system. Combined, these two components really know how to make superbly detailed and spacious music from a bunch of zero’s and one’s! 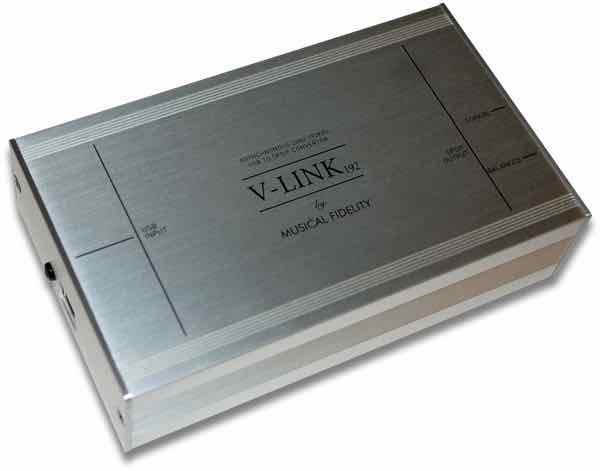 Unfortunately, the V-Link192 is no longer in production, but they can still be found on E-Bay for $135 US. but at this price and performance - I’ll live with it! If you have a DAC with a USB interface that is older than a year I would recommend getting one of these units, because it will probably elevate its performance to levels you probably thought would require a significant DAC upgrade. I have found the Dual USB Cable and Power Adapter identified in this post, Overcoming USB Streaming Issues, to work extremely well with this unit. I have also found my own DIY S/PDIF cable design, which can be found at the end of this post - RCA Interconnect Construction Techniques, outperformed some very pricey boutique brands. UPDATE: I’ve since removed the DAC and V-link192 and replaced it with the Blusound NODE 2, connected via an ethernet cable to the NAS drive. 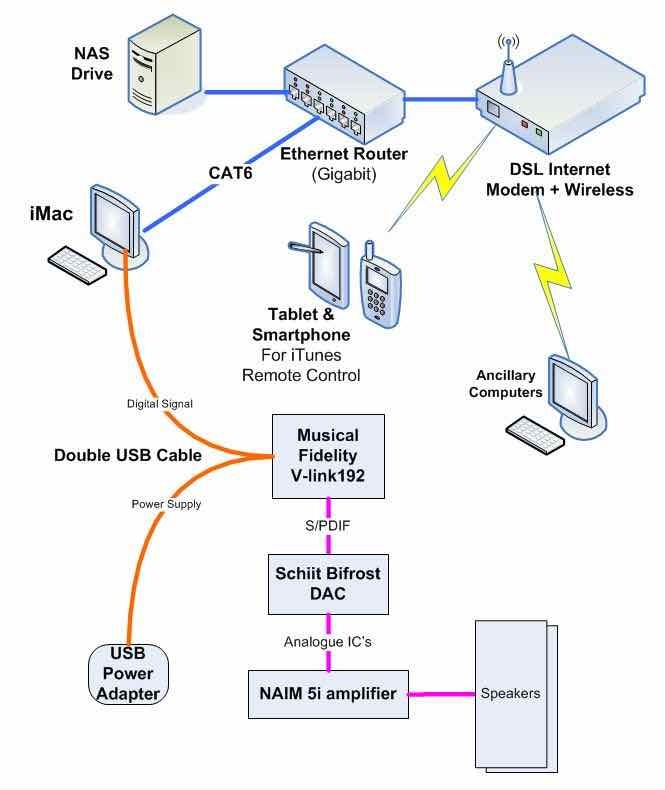 The following diagram depicts the various components I have implemented in my digital playback system. The NAS Drive is used to store all my music files primarily because it offered a facility called "Raid Mirroring". It is recommended that when implementing RAID, you to use high quality drives such as those used in servers, in order to minimize disk failures. Normal hard drives are not robust enough for this kind of use. I chose this method over a wireless link for reliability. In my neighbourhood there are a lot of wireless routers that seemed to cause dropouts during playback of the larger hi-res files. It is also the fastest method of transferring data between computers. The iMac is the computer I use to stream digital content via it's USB interface into the DAC via the V-Link192. There was a time when USB was considered to be a poor choice for streaming digital content to a DAC, primarily because the USB interface was not really designed for music, unlike other digital interfaces such as S/PDIF and Toslink interfaces. The introduction of Asynchronous USB has remedied many of the issues, together with better USB interface circuitry that is present in most current DAC designs. The USB circuitry in my V-link192 USB/SPDIF converter utilizes the power provided via the USB cable. 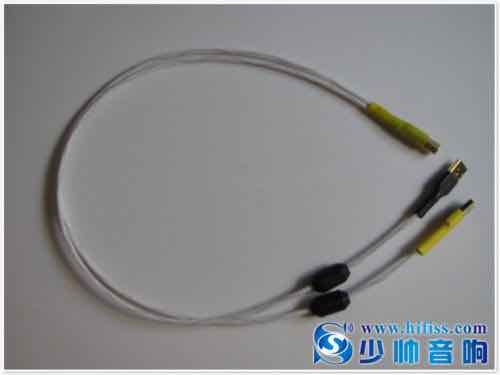 As a result of this design, there can still be noise pollution created in the USB cable itself. Therefore, I have chosen to use a Double USB Cable that consists of two separate cables that are joined only at the USB plug that connects to the V-Link192. One cable transfers only the digital signal and the second only provides the USB power. This ensures that the V-Link192 is getting the cleanest digital stream possible and the cleanest most stable USB power. It provides significantly better sound quality, but only if the quality of the S/PDIF cable is capable of hi-res transfers also - many are not. Be Aware: some brands of DAC and computer only advertise the upper limit - e.g. 24/192. So download the manual before you buy if there is not enough information available on hand to determine the max resolution for each interface. So that is my digital rig explained in a nutshell - what else is there to know? To start with there are issues that many people might not be aware of pertaining to the copying of digital content from a CD. When copying, some "Ripping Software" does not actually copy all of the raw data, but compresses it in an attempt to save space. Unfortunately this fact is not always apparent and generally goes unnoticed. The improvements in sound quality are quite noticeable. The best method of storage would be to use the format that is on the CD, but WAV presents a problem if you are using iTunes, because iTunes does not really handle the WAV metadata very well. Some formats are slightly compressed and other like MP3 are very compressed - it really does affect sound quality! Up-sampling is where the playback program will insert "interpolated data" into the digital stream before passing it onto the DAC. Interpolation is an approximation between two known data points and those that use it believes it enhances the sound. Fact is, it can actually degrade the sound quality in many cases. many DAC’s simply Up-sample without you knowing. Not Quite - there is one last thing to consider. The designers of early DAC technology believed up-sampling within the DAC was a good idea. However, as with all things in this hobby, things change and the latest approach is to allow the DAC to process the file in it's "native resolution". So What do I mean by resolution? bit depth - is the number of bits used to represent "a sample"
The higher the resolution the larger the file and the longer the download! Needless to say, this is but one example of a digital music reproduction architecture. There are limitless other possibilities, each with their own foibles to be overcome. There’s a lot of discussion on the web about why the USB interface is not suitable for streaming music. Much of the discussion promotes solutions that require the use of additional components that strip the music related data from the data stream, reassembles it with new clocking data and presents a squeaky clean version to the DAC. Some even converts the data stream to a format supported by either the S/PDIF or Toslink interface. EMI between the power and signal conductors inside the USB Cable - i.e. noise in the data stream resulting in jitter and noise in the power conductors effecting DAC performance. Addressing #3 is not covered here since it is manufacturer specific and dependent on the DAC you are using. Issue #2 may also related to the DAC you are using because some DAC’s utilize the USB power supply to power their own internal USB circuitry. Those that use their own internal power supply are much better equipped to handle a USB Data Stream. Issue #1 boils down to the USB cable you select - not all cables are equal! Now, you can still insert both USB cables into the computer, but for the best solution a separate power supply should be used. 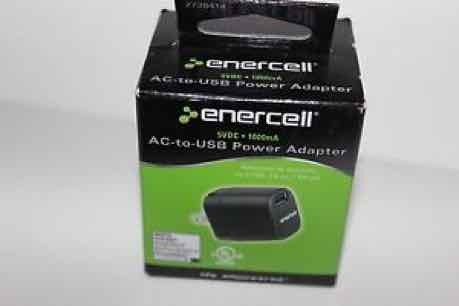 I have found that using this adapter is as effective as using a battery power supply, which is perhaps the most stable 5 volts you can get. Now, this IS NOT the be-all and end-all of solutions for USB interface issues, but for those of you looking for a cost effective solution that will address many of the most severe problems without adding even more components and cables to your rig and more importantly, without breaking your bank - then give it a try.